The Picos de Europa National Park nestled in which bears his name, height and showmanship are one of the most beautiful landscapes that nature presents us in the Principality of Asturias. Llanes taking as a starting point, we can approach them in just half an hour away by car. From the town of Llanes Posada we took the road leading to Alto de Ortiguero. There exists a junction with the road between Cangas de Onis and Arenas de Cabrales. Take the direction Arenas-Poncebos-Sotres. The karstic landscape is overwhelmingly there, including gorges and gorges, rivers and valleys dream and large native forests. Peak also home to a significant density of wild fauna and flora, subalpine, above 1,600 meters. Below this level we find forests of beech and unforgettable sheepfolds. Small towns scattered across the middle and high mountain, let you check the hospitable nature of rural communities settled in the area. This large limestone formation extends about 40 km. Long (east-west) and about 20 km. Wide (north-south). Its constitution is continually obliged to undergo demanding erosion from rain and snow, which taking its toll on their constitution, offer very attractive to lovers of caving chasms. Some reach up to 1,400 meters deep. Morphologically we found in the Picos three distinct massifs: the western massif (The Cornión), the central massif (Los Urrieles), and the eastern massif (Andara). are physically delimited by the gorges of the legendary salmon rivers Sella, Cares, Duje and Deva. 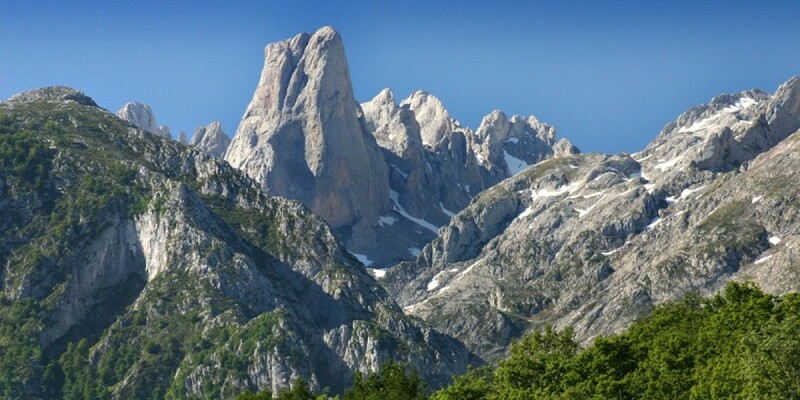 The western massif with its highest peak, Peña Santa de Castilla (2.596m), is the largest and most varied of the three, and is particularly suitable for hiking.